In this worksheet, students will learn about what solutions are and their different components. A solution is a transparent (see-through) liquid. Solutions can never be cloudy or opaque. 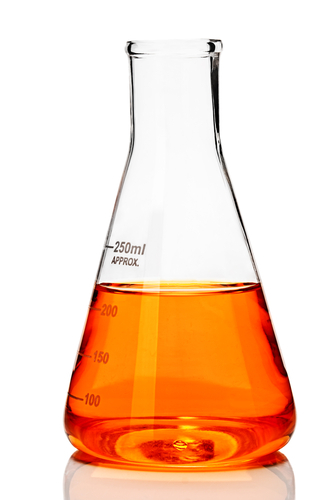 For example, the liquid below is orange but it is clear, so it is a solution. In a solution, a solid dissolves in a liquid. The solid particles are held tightly together in a fixed arrangement, but they are taken away from the liquid particles. 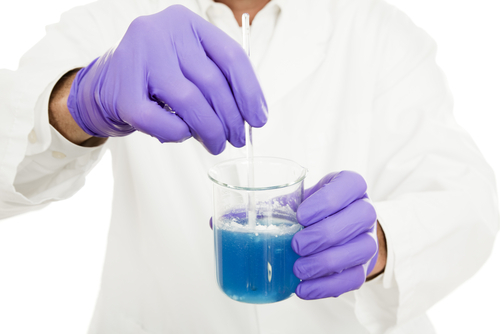 The solid substances that dissolve are called solutes and the liquids they are dissolved in are called solvents. A solute dissolved in a liquid makes a solution. Substances that dissolve are said to be soluble, whereas those that do not dissolve are said to be insoluble. All opaque liquids are solutions. Is the liquid in the picture a solution? What happens to the solid particles when a solid substance dissolves in a liquid? They are held tightly in a fixed arrangement. They are separated when the liquid is added, as they mix with the liquid particles. A solid dissolves in a liquid. They form a ___________ . Sugar dissolves in water. The solute is __________ . Nail varnish dissolves in propanone. The solvent is _____________ . Nail varnish does not dissolve in water. We say, nail varnish is _____________ in water. Sea water contains salt. Salt is __________________ in water. 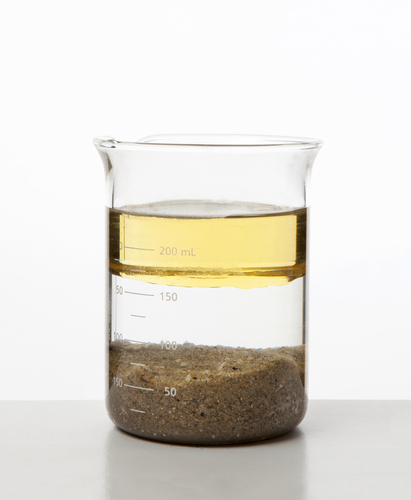 The beaker contains oil, water and sand. Choose two correct statements about the contents of this beaker. Oil and water do not mix; they are insoluble in each other. Sand is soluble in water. Sand is soluble in oil. Sand does not dissolve in water. The statement is false. 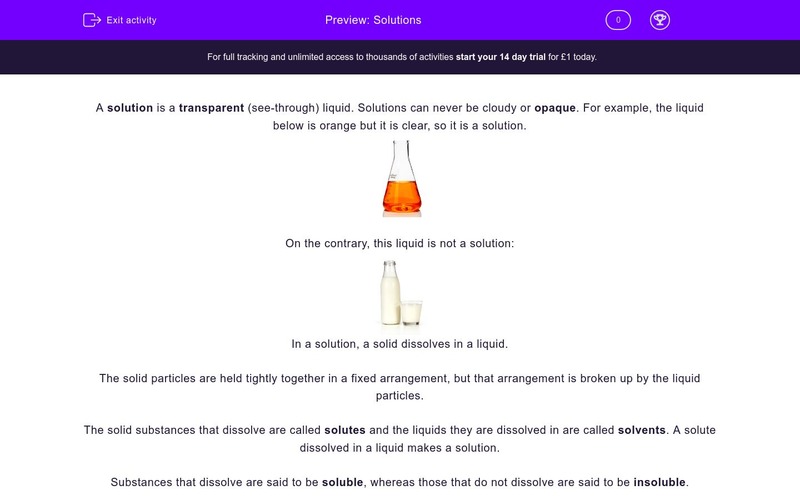 Opaque liquids are not solutions; solutions can only be transparent. The liquid in the picture is cloudy, therefore it is not a solution. Solid particles are separated when the liquid is added, as they mix with the liquid particles. When a solid dissolves in a liquid, they form a solution. The solute is the solid that dissolves, in this case, sugar. Propanone is the solvent for nail varnish, as the latter dissolves in it. Propanone is used in nail polish removers. Nail varnish is insoluble in water, as it cannot dissolve in it. Salt is soluble in water; that's why it is possible to have salty sea water. • Oil and water do not mix; they are insoluble in each other. • Sand does not dissolve in water. The latter is correct for this specific mix; in reality a tiny bit amount of sand can dissolve in water, but it is so small that we think of sand as practically insoluble in water. 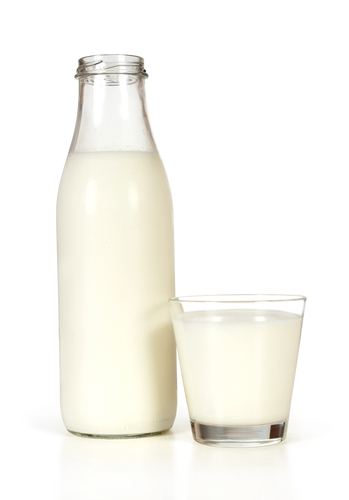 Milk is opaque; therefore it is not a solution.